This was a simple but lovely treat on an extremely hot summer afternoon. I had been snacking away on my first figs of the season when I remembered the bag of frozen bananas in the freezer. Combined with whole milk, fresh figs, and a touch of local honey, I had a feeling that one of those bananas would turn into a unique and delicious shake. I was right. Place all ingredients in a blender; process until smooth. Serves two. These sound great - I will have to start looking for fresh figs around here. You might want to pop over to my blog and link this great recipe up in today Meals on Monday post! I would never think to put figs in a milkshake but damn this looks good. Haven't bought figs in ages. Thanks for the reminder of their versatility. So are figs in season again now? I'm so confused by the west coast climate... I thought it was a fall thing! It's clearly taking me a while to not think like an east coast gal. I wouldn't have thought to put figs in a milkshake but this sounds soooo delicious! I'm wishing we had fresh figs here. It seems like a coincidence that you posted this b/c I just made an apricot and banana milkshake just like your recipe (drinking right now). It WAS going to be a fig and banana milkshake, but I got scared. Will DEFINITELY try the figs now! I used plain Brown Cow yogurt, but whole milk sounds delicious. Keep em coming! Yum, what a great recipe, I'll definitely be trying it out. I love Figs! I would not have thought to use them in a milkshake, but together this seems like a perfect milkshake. Thank you for sharing!! 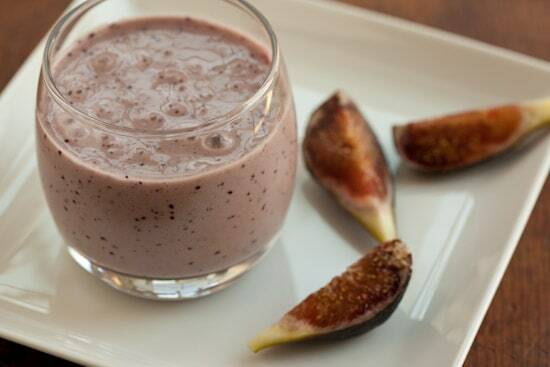 i LOVE figs and have never tried them in a shake! what a great idea!! We had some early figs a couple weeks ago at the market I volunteer at and I was so excited...until I brought them home and really had no idea what to do with them. This looks like a perfect idea!! I also have some super ripe peaches, I might try peach and fig as well! I have never had a fig. Aren't you sad for me? Maybe I need to go find some soon so I can make this. What a beautiful recipe! I adore fresh figs but they are pretty hard to come by. I love the bubbles on the top of your milk shake! Looks quite tasty. Beautiful presentation and photo. Makes me wish I hadn't skipped breakfast this morning. That is so beautiful and sounds so good. I could eat fresh figs with an old car tire, but in a milkshake with a banana? Perfect. I live in the south and have actually never seen fresh figs in my local grocery stores. I've always wanted to try them. Maybe some day I'll stumble upon them. And when I do, this sounds good. Figs and bananas...duh! I don't know why I never got there with my own flavour pairings :) This looks like something I have to try soon - I had some figs in the house last week. This sounds incredibly amazing!! I cannot wait to try it! Can I buy frozen figs for this? I live in Indiana and it is near impossible to find fresh figs.